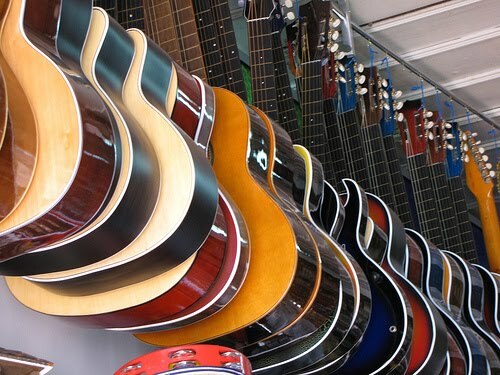 Since their origins in the ancient east almost 5000 years ago guitars have evolved into many shapes, sizes and styles. The modern guitar is most commonly found in four familiar forms, each most suited to the demands of players in different styles of music. In this article we'll look at four kinds of guitar and their usual styles of music. Although there is little reason not to try a guitar in a style it's not usually associated with most players stick to the kind of guitar most suited to the style of music they wish to play. If you plan to learn guitar you will find it easiest if you choose an instrument suited to your preferred musical style. Since Antonio Torres Jurado designed and built what is widely recognized as the first classical guitar in Seville in the mid nineteenth century the form of this instrument has changed little. The classical guitar's familiar silhouette is defined by the balanced proportions of its rounded body. The top is often made of cedar which gives a soft warm sound while the sides and back are traditionally composed of rosewood. Classical guitars possess wide necks suited to finger picking individual notes. The nylon strings, originally made from cat gut, are broader and softer than their steel string equivalents which make them easier on beginner fingers. The guitar is most commonly used to play classical or flamenco guitar but is also found in folk, Latin and pop styles. The softer sound of nylon strings is favoured by many jazz guitarists. The classical guitar's strings do not work well with bending techniques used in blues and rock music. Steel strings for acoustic guitar were made popular by guitar builder C.F. Martin in the early 20th century. Martin moved to the USA from his native Germany in 1833 and used an X bracing system popular in America for the tops of his acoustic guitars. Martin added steel strings in response to demands from players for louder guitars. The higher tension of the steel strings was supported by the stronger X bracing system used rather than the fan bracing more popular with European classical guitar builders at the time. The steel string acoustic has evolved into a number of different shapes and sizes. The most common found today are concert, jumbo and dreadnought forms. All can be found in cutaway versions that allow easier access to the higher frets for soloing. The steel string acoustic guitar has a flat top. Its neck is typically narrower and more rounded than classical guitars, although the width, profile and length of the neck vary depending on the guitar's intended purpose. The steel string acoustic is one of the most versatile guitars and can be used to play just about any style. It is most commonly found in blues, folk, bluegrass, pop, rock and country music. Despite steel strings, acoustic guitars were still not loud enough in large bands or noisy joints. But the arrival of electrified amplification in the 1930s created a real revolution for guitar players. Electric guitars used a magnetic pickup fixed to the guitar's table to create a small current when the strings vibrated in its magnetic field. This current is then amplified by an external amplifier to produce sound. Electric amplification gave guitars more volume and sustain. It also permitted use of lighter strings at lower tension which opened up lots of new playing techniques. This kind of guitar is used in all modern styles but is most commonly associated with jazz, blues and rock 'n' roll. Early amplified guitars caused feedback problems because of their hollow body construction and loud playing volumes. Several builders developed guitars with solid bodies to overcome this problem. The first successful commercial guitar of this type is the Fender Esquire, commercialized by Leo Fender in 1946. The Esquire became the Telecaster and Fender went on to create the legendary Stratocaster guitar in 1954. These guitars use a solid piece of flat wood about an inch thick with a neck attached to it. The magnetic pickups are mounted in this solid piece of wood which vibrates less than the table of a hollow guitar to avoid feedback problems. Names such as Fender with its Telecaster and Stratocaster and Gibson with its Les Paul model became icons of the rock era. These guitars are also used in many other styles such as the blues, funk, jazz, pop, country, just about anything in fact.